► Have you defined your ideal customer? ► Do you have a strategy for forging effective relationships with them? ► Do you have a focused and effective marketing plan? 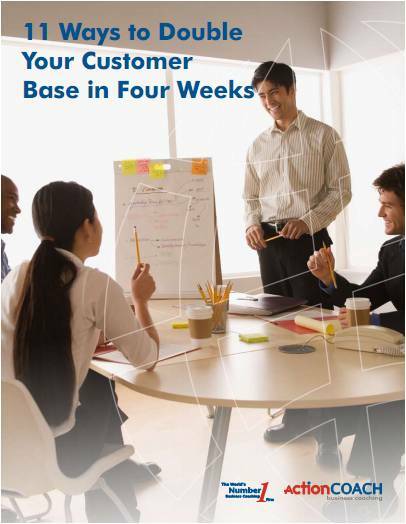 This whitepaper discusses how to define your ideal customers and attract more of them. You will learn the importance of a good referral program and how to establish strategic alliances. In addition, it covers the 5 main areas of the business to be studied and monitored. Finally, you will see how tie it all together in just 4 weeks. ActionCOACH is the #1 Business Coaching firm in the world. Steve Goranson has been coaching businesses in Northeast Florida to greater success since 2005. Steve was the recipient of the 2012 ActionCoach MarketingCOACH Award and member of the ActionCOACH Presidents Club. Please fill in the information below and ActionCOACH Steve Goranson will send you a complimentary E-Book entitled, 11 Ways to Double Your Customer Base in 4 Weeks.